Paying attention to front porch construction details results in award winning porch designs that add value and curb appeal to any home. 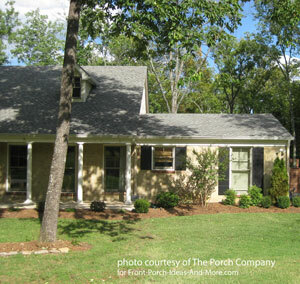 Mary and I are honored to feature porches designed and built by The Porch Company in Nashville, Tennessee. 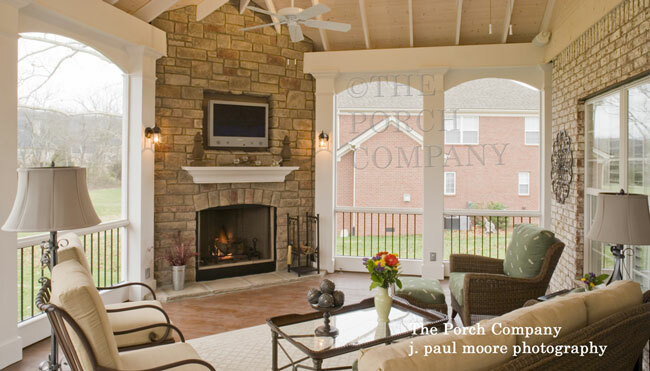 The recipient of many awards, The Porch Company is known for its attention to detail and aesthetically pleasing designs. 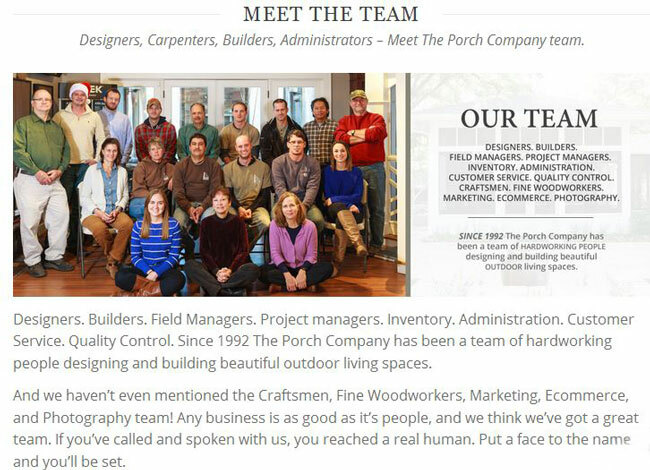 The Porch Company is one of our fine sponsors and we have the good fortune to know their work and their amazing staff. 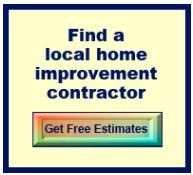 We feel proud to recommend their porches and products. Little things matter when it comes to designing and building beautiful, functional porches. Paying attention to details is important to The Porch Company. 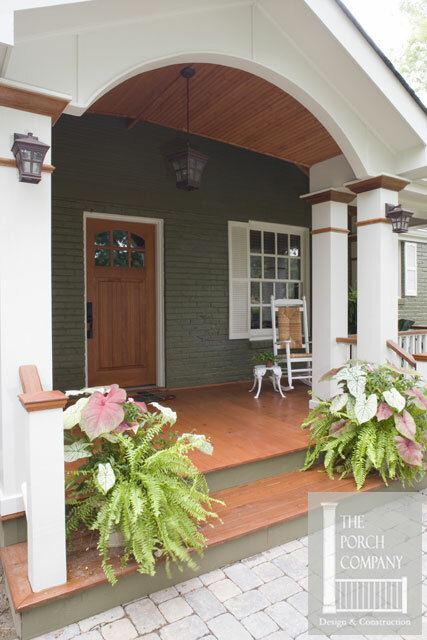 We'll point out many front porch construction details in the photos below to show you why using professional contractors like The Porch Company is important to adding value to your home. 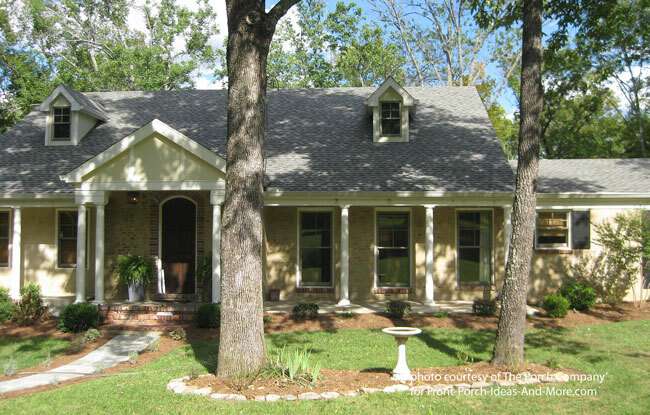 Let's start by examining some before and after pictures of a wonderful home and front porch courtesy of the The Porch Company. 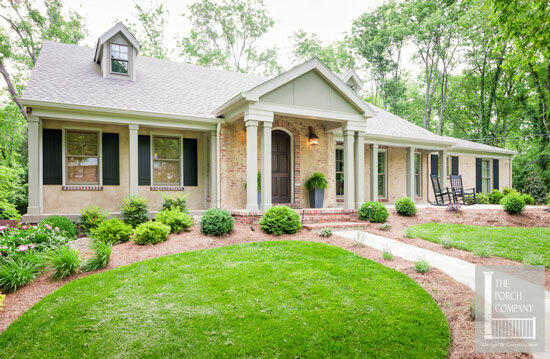 Although the original builders built a beautiful home, focusing on a few front porch construction details will add a new dimension and plenty of curb appeal. Note the round porch columns which are not necessarily proportional to the architecture of the home. 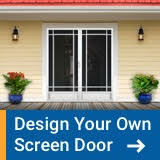 In addition, the front door gets lost on the front of the home and the porch lights are positioned a little too high. In addition, adding a few nicely designed construction details to the windows will increase the overall charm of the home. Like "diamonds in your own backyard", we often neglect to see the full potential before us. 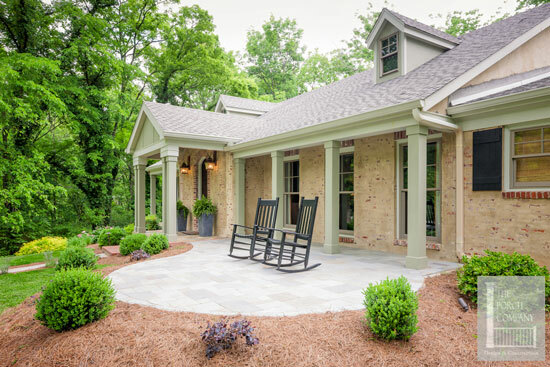 Although landscaped, this portion of the front of the home can be used to add both functionality and extra appeal by integrating it into the overall front porch design. 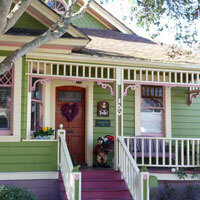 A little "nip and tuck" - meaning a facelift, can literally transform a front porch and home. Often times we become accustomed to how things are and not what they could be. This front porch and surrounding yard occupy a wonderful space and with the right construction details can yield big results as seen below. After - Now Take a Look! 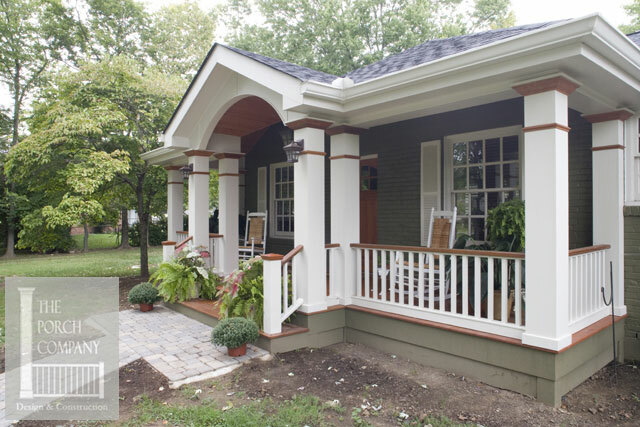 Replacing the round porch columns with double square ones gives this home not only an updated look but also makes it more architecturally appealing. They lowered the light fixtures and used copper back plates to cover the existing holes. 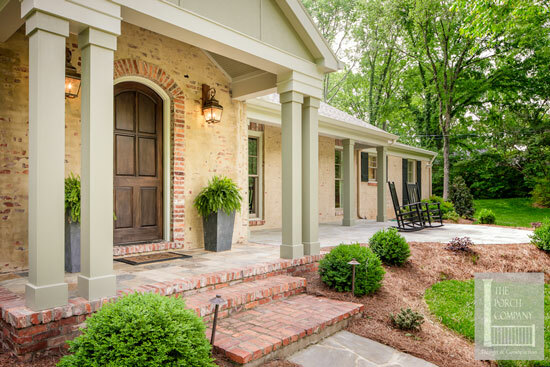 Something to notice: The large planters on either side of the front door are elements of design that create a classic look on almost any front porch. The porch was extended by means of a patio into the front yard. This not only gives the home and front porch a more expansive look but also is a better use of space. 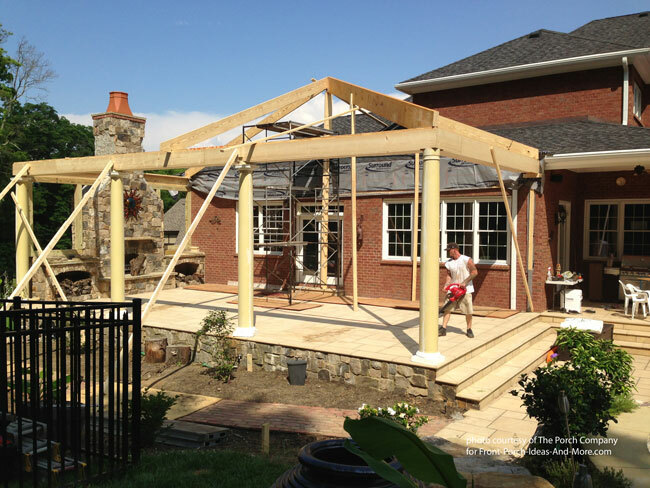 Now the owners, family, and friends can have protection from the weather or enjoy an evening under the stars. The Porch Company, well known for its front porch construction detailing, added brick sills to the windows on the left side to match the windows on the right. They also added shutters to balance the windows on the right along with redesigning the cornices on the dormers to alleviate the gutters. 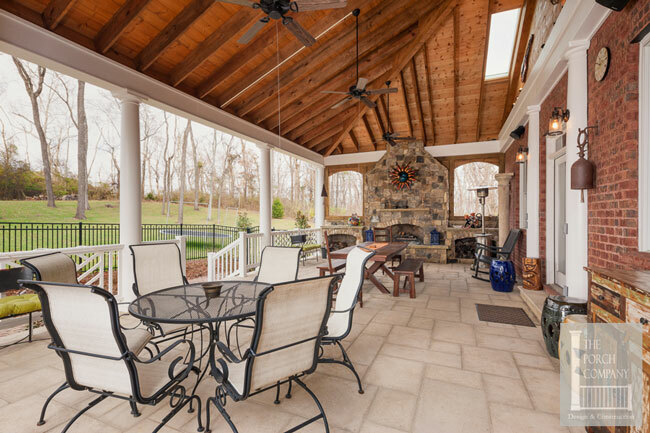 Just as a treat, we want to show you these beautiful pics from one of The Porch Company's most recent projects. 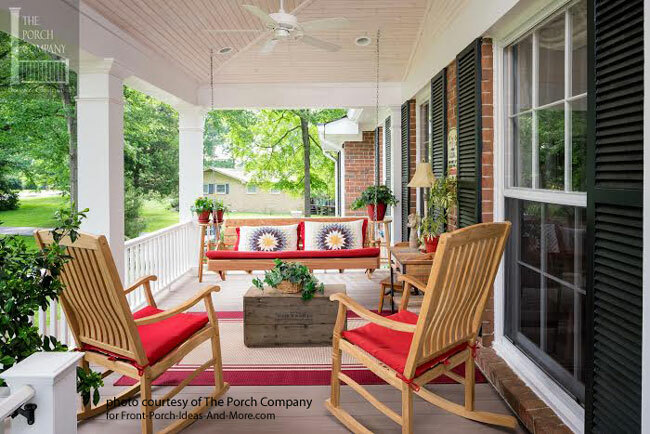 Take a look at this inviting front porch, will you? 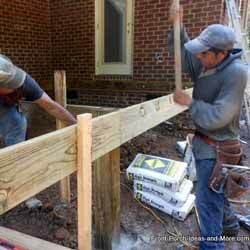 The front porch construction details are sure to be appreciated by these homeowners. Anyone care to rock on this wonderful porch? Mary and I love this porch transformation and it is all because of front porch construction detailing. 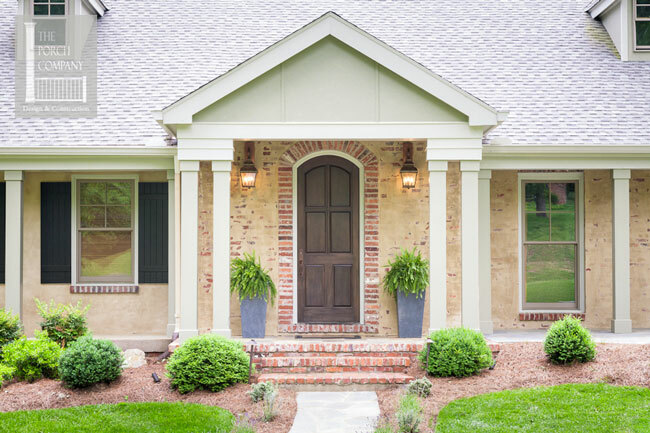 They took this modest ranch home, added vision along with construction expertise, and created a most charming front porch. You can't help but want to spend some time on this porch. 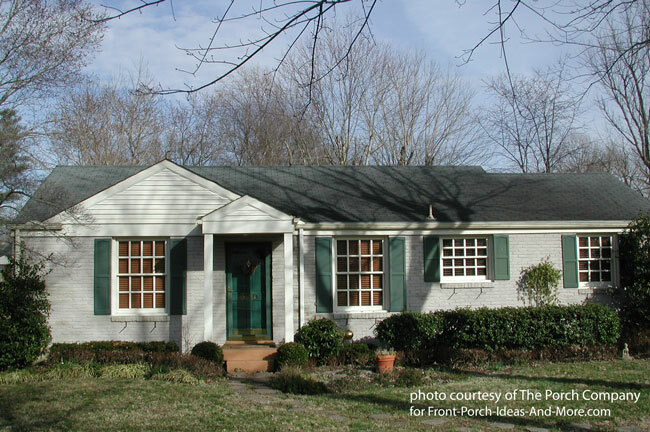 They started with a modest but dated ranch home that had a small front stoop. They painted the home a dramatic dark olive color which by itself would have been changed the look of this home. 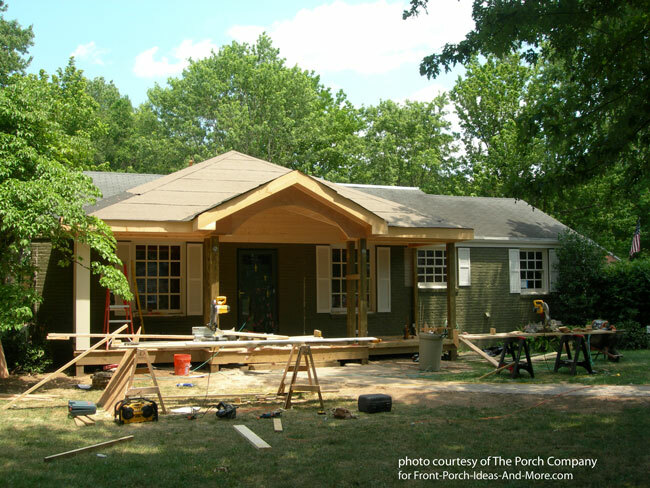 In order to build a new front porch, and to give it the right depth, they built a hip roof and gable roof combination. The hip roof provides the necessary space while the gable roof, located in the middle, focuses on the front door to define the entrance for visitors. 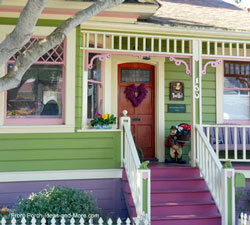 Color plays an important role also when highlighting porch construction details. 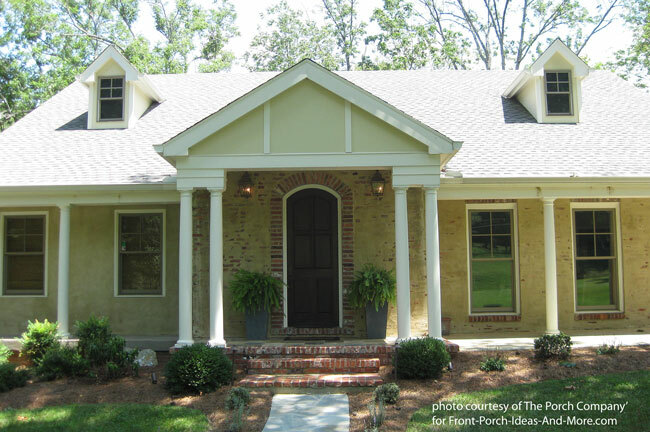 The large box columns add dimension to the porch and the wood trim accents match the floor and door color. In addition, the stained beadboard ceiling reflects the stain on both the floor and door. They also used the same wood stain accent on the cap rail. Otherwise, the porch is white which speaks tradition and comfort. 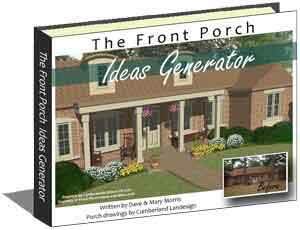 Put it all together and you have an amazing front porch from The Porch Company. 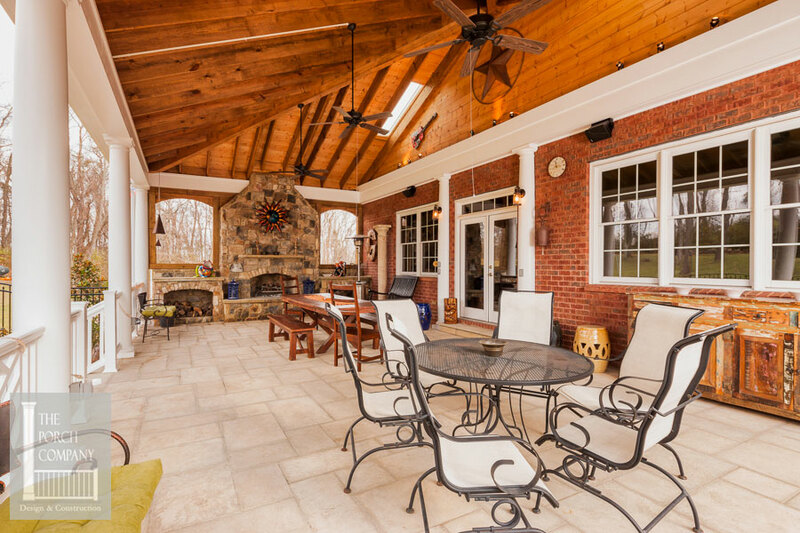 Imagine having a back porch of your dreams complete with fireplace and space for entertaining. Before: What would your vision be for this future porch? To integrate the existing fireplace and create this amazing porch, paying attention to critical porch construction details was paramount. In order to create the space, a huge hip roof was constructed to provide shade and make it complement the scale of the home and space. Otherwise, the ceiling would be too low. The roof is supported with round permacast columns to match the ones on the home. Arches were used to support the roof structure adjacent to the fireplace giving it maximum strength. Building structural components is essential but making them appealing takes experience. The folks at The Porch Company, we believe, did a fantastic job as you can easily see. 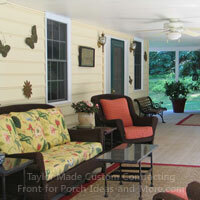 The Porch Company also builds beautiful custom screen porches too. Relax in total comfort with all the amenities to make your outdoor time more enjoyable. 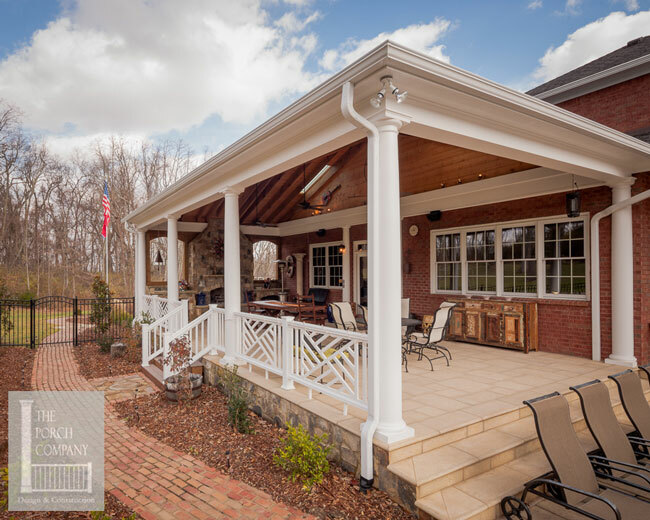 Mary and I can unequivocally recommend The Porch Company as a premier builder of custom porches and screen porches. 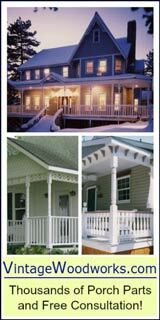 They are one of our fine sponsors but we can personally attest to the quality and beauty of their custom designed and built porches. We've seen their work up close and personal and met their caring staff. 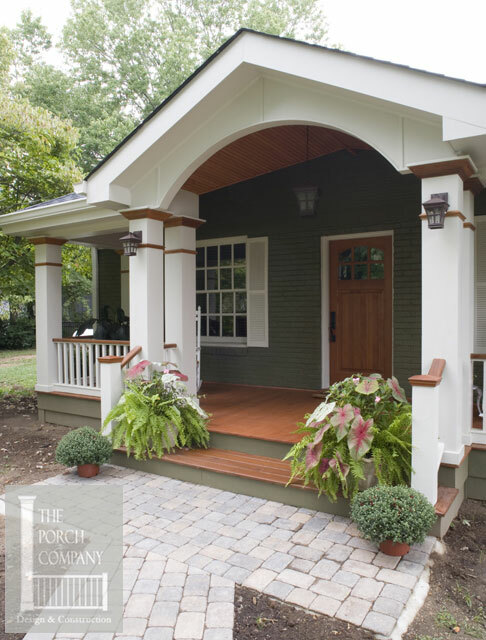 If you desire this level of quality in front porch construction details and live in the middle Tennessee area, be sure to contact the good folks at The Porch Company. 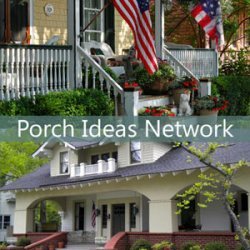 Be sure to listen to our podcast where we feature Nancy Moore, founder of The Porch Company. 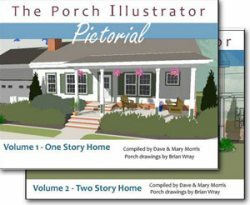 She is a delight and a true porch lover - not to mention the endless talent she has for designing and building porches. 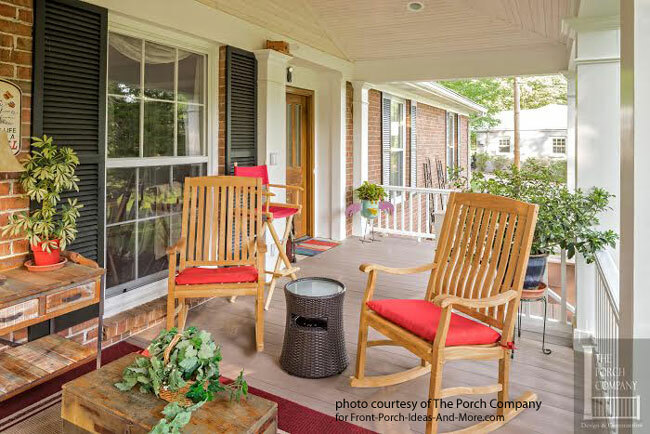 Visit The Porch Company's Porch Store where you can find beautiful custom products for your porch or screened porch. 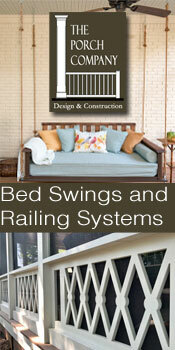 Take a look at their adjustable bed swings (and even custom bedding! 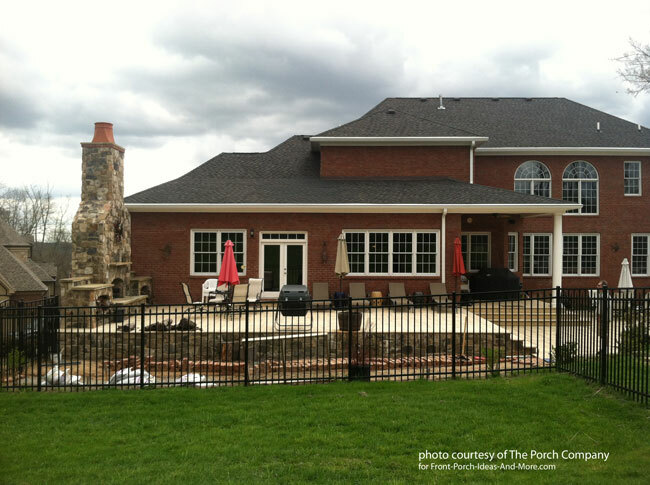 ), beautiful gates, elegant porch panels and custom PVC railings. 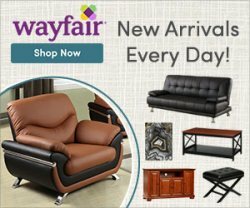 All the products in the Porch Store are carefully thought out and tested by The Porch Company's craftsmen.